Wendy joined our office while at the Middle College High School as Marlene’s assistant. 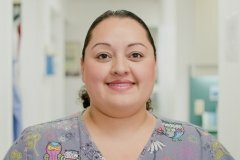 While continuing to work for us she earned an Associate Degree from Contra Costa College and went on to Western Career College for her dental hygiene degree and license. We’ve enjoyed watching her progress in her career and at the same time meet the needs of the practice and our patients. She lives in Oakley with her husband, Luis, and two girls, Julianna and Isabella. By the way, she is a huge Giants fan!